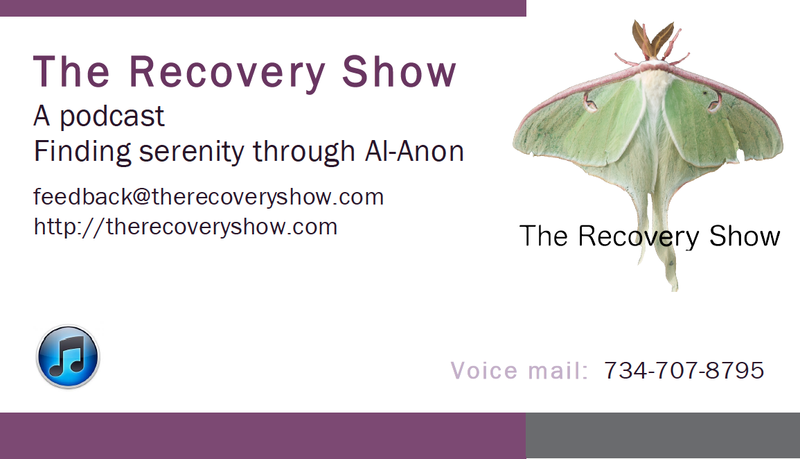 Tell your friends about the The Recovery Show. Simply hand them one of these business cards, and they will find us easily. The cards are designed for Avery 8871 business card stock, or any compatible stock. But, you can also print them on plain paper, on plain card stock, or on photo paper, and then cut them out with scissors. Our apologies to our “overseas” listeners, as these are designed for US paper and business card size, but you should be able to print them onto A4 stock and cut them out by hand. Click on the gray link just above this paragraph, or on the sample card below to get the PDF file. Sorry. Wher ca I get the biz card file to print? The link to the pdf is at the top of the text above. I think these cards are fabulous!! I had tried to create a flyer, but because you are not CAL cannot offer it in my meetings. These cards give me a chance to share you with other members after the meeting without violating any guidelines. This site has been absolutely a life saver for my recovery, not only with your podcasts, but your links to other sites (i.e., al-anon journal, Recovery Radio Network, etc) have been invaluable. Many blessings to you for all your work.